Hike for about three hours to the Samye Monastery (3600m above sea level) via Wango and Dragmar. Walking through a forest and a small village, the trail becomes increasingly barren when approaching the monastery. Then cross the Yarlutsangpo River by ferry to visit the Samye monastery, the first Tibetan Buddhist temple ever built in Tibet. Stay overnight at the campsite. Depart from the Samye monastery to Tsedang. Pay a visit to Yumbulagang Palace,Tibet's oldest building, and take in the fabulous view of the Yarlung valley. Then move to Trandruk temple, which is located about 3km up the Yarlung Valley from the city of Tsetang. Stay overnight in a hotel. 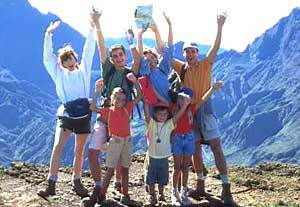 1) This trip is strenuous, and requires camping and trekking skills as well as physical stamina. 2) Good clothing, excellent mountain boots and basics such as sunscreen, sunglasses and lip balm are a good idea to bring along. 3) The best season for trekking in Tibet is from late May to mid-October, however you must be well-prepared at all times for wet weather, snow and cold winds.